My most recent Pakihi escapade came hot on the heels of Easter’s ex-tropical cyclone Ita, which slammed the Eastern Bay of Plenty with an all-night lightning storm, tree-downing gales and, in one terrific downpour, 100 mm of rain in less than two hours. 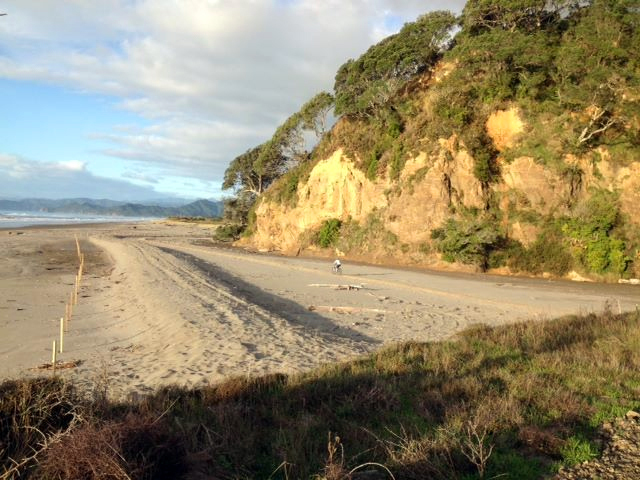 Two days after that, I was joined in Opotiki by Toni Keeling, who had already finished the GODZone expedition adventure race and the Coast to Coast Longest Day this year. “I’ve only done one ride since GODZone,” Toni grinned. 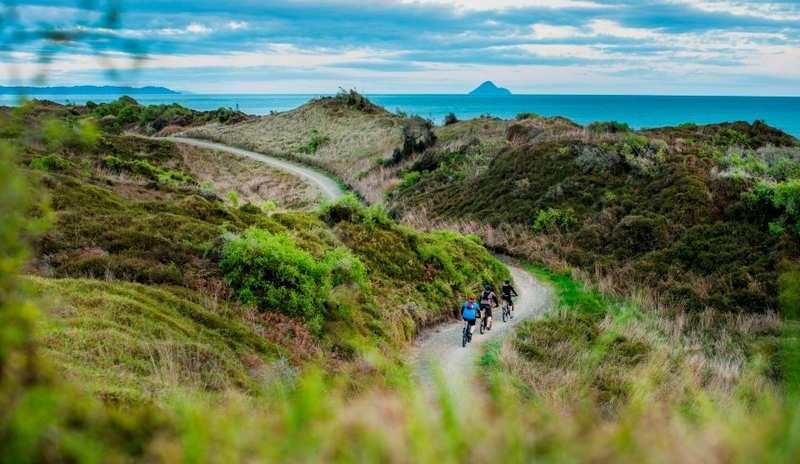 But, typically, she was dead keen to do the whole 93 km loop of the Motu Trails: out on the Dunes Trail, up the historic Motu Coach Road, down the Pakihi, and back on the tar seal to Opotiki. 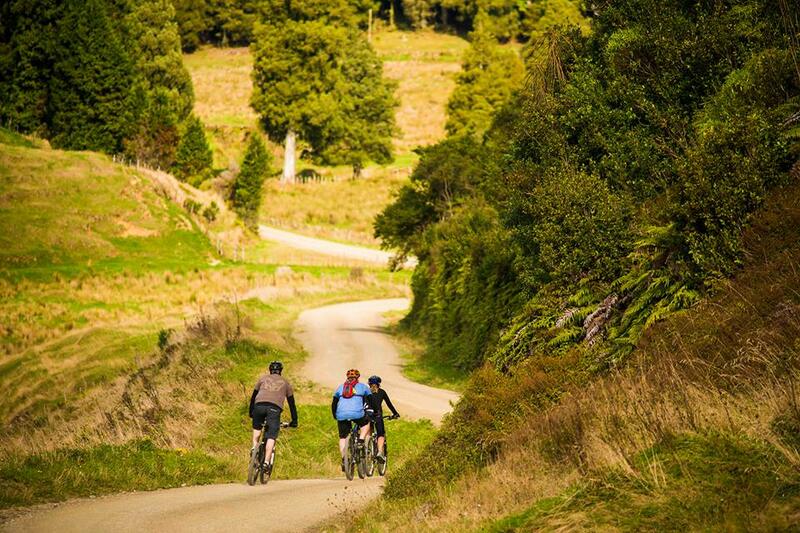 The Dunes Trail is a cinch, purpose built to answer New Zealand Cycle Trail (NZCT) standards. But it’s still a great legwarmer, rolling east over tussock-dressed sand dunes, with panoramic views of the Pacific. Surprisingly, there were no other riders. And the usually common weka must all have been sleeping in. After an hour, the Motu Coach Road clicked up the challenge (a big yellow road sign pulls no punches: “NARROW WINDING ROAD NEXT 48 KM EXTREME CARE”). With tight corners and precipitous drop-offs, ‘The Motu’ used to be one of the famed stages on the World Rally Championship calendar. It’s still the highlight of the Motu Challenge multisport race — a fave of ex-Whakatane MTB rider and 2011 national XC champ Carl Jones. A few times I could admittedly have done with the horsepower of a Jonesy or a Colin McRae, but we made steady going, and reached the start of the Pakihi by early afternoon. 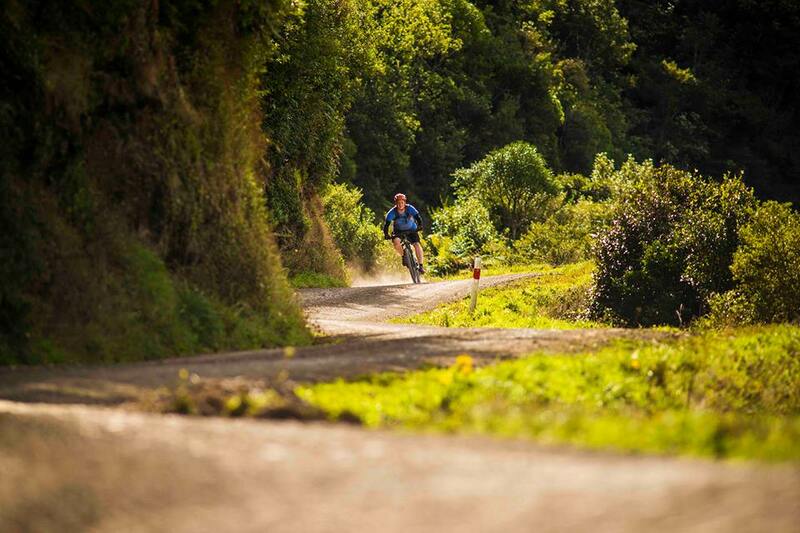 Jonathan first rode the Pakihi in about 1996, while researching for Classic New Zealand Mountain Bike Rides. 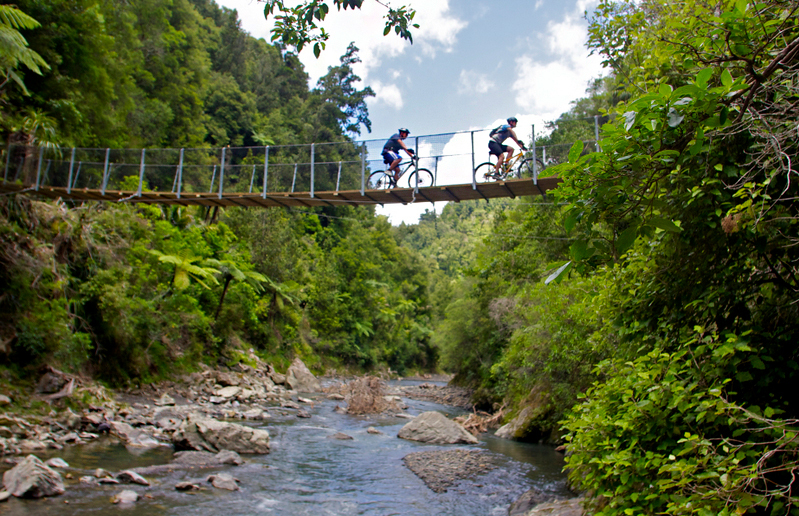 Fortunately, in 2010 there was an unexpected saviour in the form of the New Zealand Cycle Trail. The Department of Conservation (DOC) had been aiming for some years to restore the Pakihi for trampers and hunters, and got behind the concept of reopening access to bikers as well. With two work teams, one from each end, DOC brought the Pakihi back to life, better than ever. 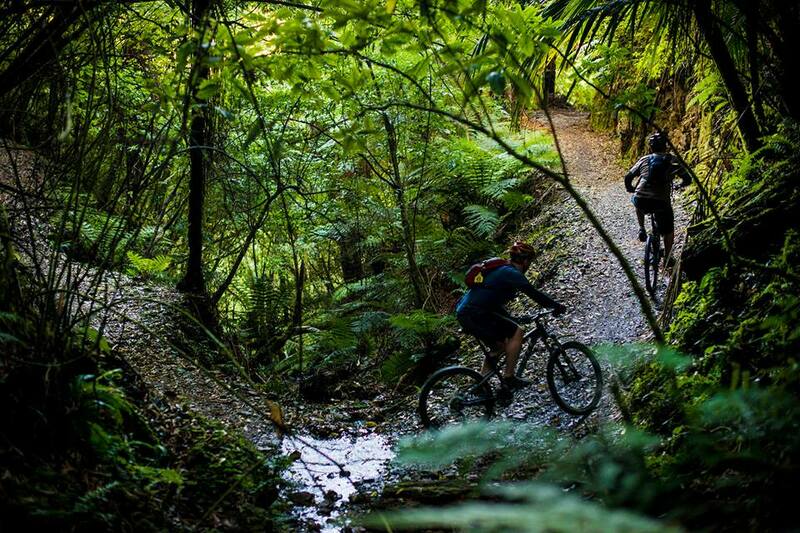 As soon as we dropped off the Motu Road, Toni and I were into magic riding, below a dense canopy of forest, with punga fronds pushing in. It’s wide and evenly graded, but a glance down confirms that you’re sidling an extremely steep slope. Time and again, you skirt into a tight gut, cross a short wooden bridge, and return to the bush-clad face of the hill, all without changing more than a few metres in height. I pedalled the Pakihi a year ago with four keen Australians, and they kept commenting how the scale of track work is unreal. 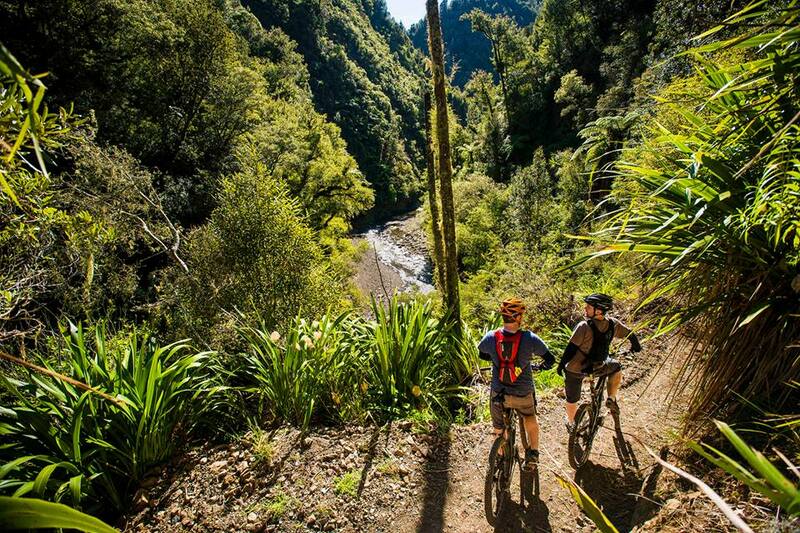 The 11 km upper section, with a dozen bridges and a total descent of about 300 metres, ends with a short sidetrack to the Pakihi Hut, which was built in 1969 by the New Zealand Forest Service (forerunner to DOC), for hunters. The hut was originally big enough for 6, but the 2013 addition of an enclosed verandah and benching stretches that capacity. It’s backcountry basic. But, for a lunch stop, it’s the best place on the trail — and if it’s sunny, there’s a picnic table. Toni and I rolled straight on down, into the spectacular 10 km lower section, which starts by taking a tight twist into a shady gully with a small crashing waterfall. A few minutes more and we’d reached a 35 metre long suspension bridge, crossing the Pakihi River just above the confluence with Papamoa Stream. The bridges keep coming, all numbered: 18, 19, 20, 21…. 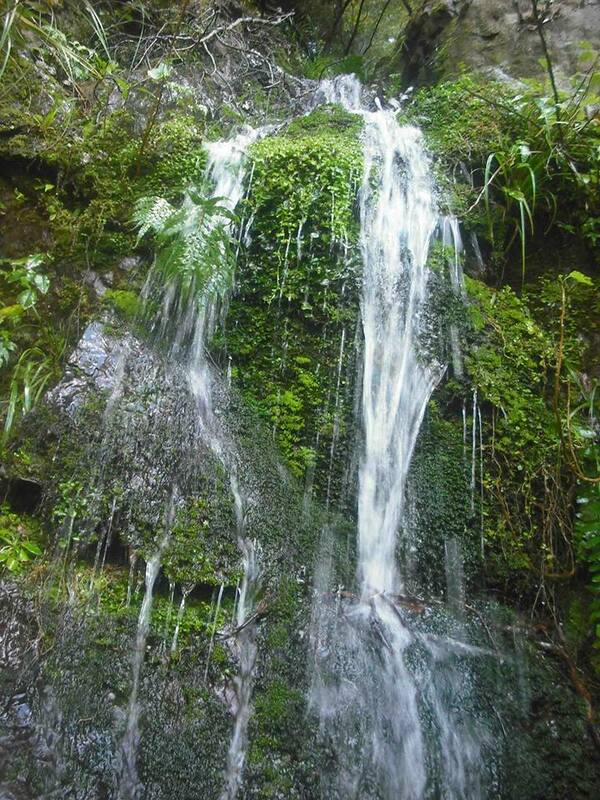 We paused several times to look left to small waterfalls, the cold hanging in the still air. I love these spots most of all in summer: the lichens and ferns stay fresh, the nikau throw shade, and there’s still ample water to fill a bottle. Then, around bridge 24, the valley stretches open. The track widens and straightens. The sun warms. Suddenly, you pop out on the road end, and it’s over. “There’s stunning scenery all the way down, and a great variation,” said Toni, when I asked for her perception as a Pakihi first-timer. Several shuttle providers offer group drop-offs and pick-ups around the Motu Trails. 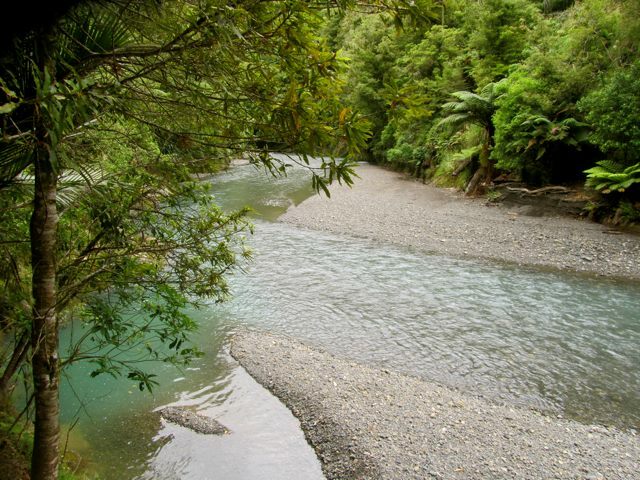 There’s a range of accommodation, including in Opotiki, Ohiwa, Tirohanga, Toatoa, Motu, Pakihi Valley and Te Waiti. If you’re not keen on riding, the Pakihi Track is also a superb walk. From the Pakihi road end you can walk to the hut and back in about 5-6 hours. 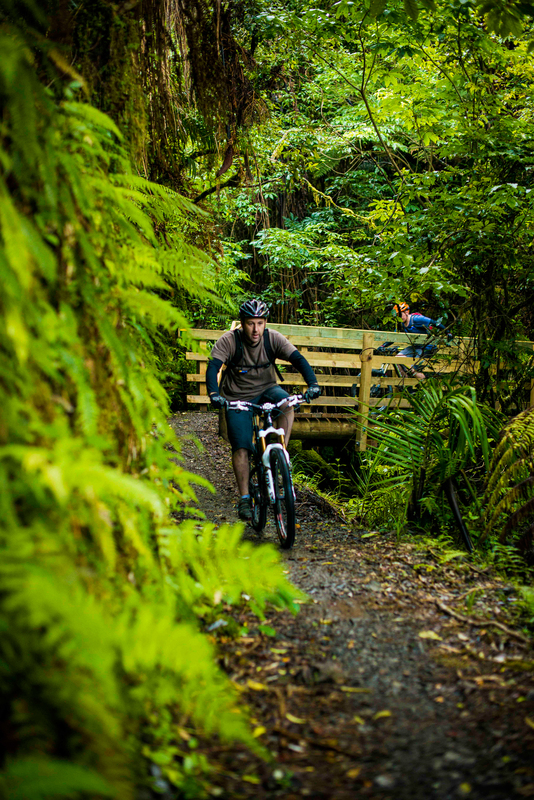 Find out more at www.themotutrails.co.nz or ask in the iSITE at Opotiki or Gisborne. Get news and track updates on the Motu Trails Facebook page. 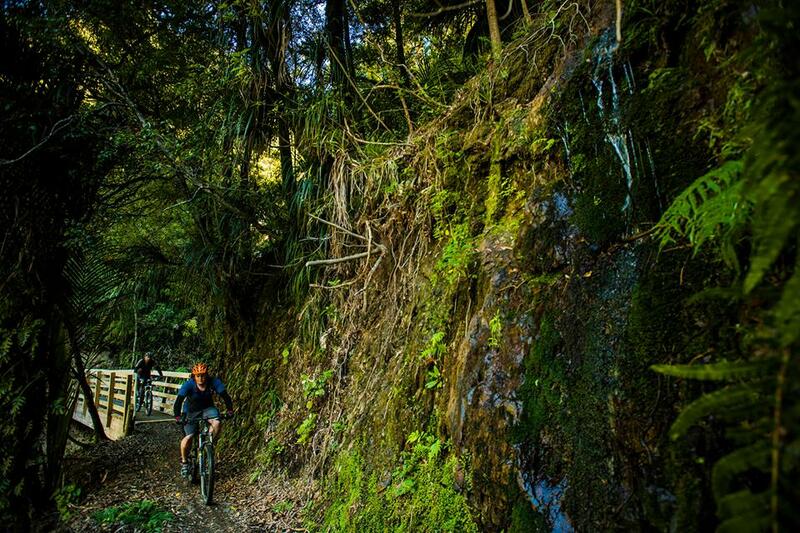 Abridged from ‘Glorious Pioneering’ in the June/July issue of New Zealand Mountain Biker Magazine. Rode this about a month ago and just finished putting up the pics on fb. What a ripper of a weekend it was , legs were aching a bit come monday! Friends actually rode this at the weekend and loved it. DOC are doing a fantastic job incorporating some great back country exploration for both hiking and biking. What a awesome ride, I want to do it!